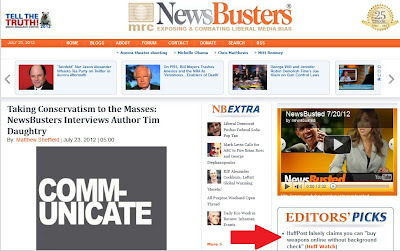 Huff-Watch: HuffPost lies: Claims you can "buy weapons online without background check"
UPDATE 1, July 23, 7:30pm: HUFFPOST SURRENDERED (partially): As documented at the end, sometime late in the afternoon of July 23, HuffPost changed its story page headline, and admitted it had done so. Yet it still has the false headline on its front page --- demonstrating once again that this was no simple "mistake," as it likes to claim when it's caught in another lie. An "arsenal" is defined as: "an establishment for the manufacture or storage of arms and military equipment b : a collection of weapons." Most people accept this common definition. A reasonable reader could only infer from this headline that the Aurora madman was able to obtain the weapons he used in his massacre online --- with no background checks. And look at the picture of those scary weapons! 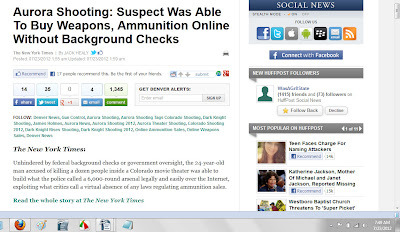 Those must be the ones (or like the ones) that he... supposedly bought online, with no background check. Shocking!!! Just one little problem: HuffPost's headline is a lie --- and it knew, or should have known it was a lie, before publishing it. Unhindered by federal background checks or government oversight, the 24-year-old man accused of killing a dozen people inside a Colorado movie theater was able to build what the police called a 6,000-round arsenal legally and easily over the Internet, exploiting what critics call a virtual absence of any laws regulating ammunition sales. "Suspect Bought Large Stockpile of Rounds Online"
With a few keystrokes, the suspect, James E. Holmes, ordered 3,000 rounds of handgun ammunition, 3,000 rounds for an assault rifle and 350 shells for a 12-gauge shotgun — an amount of firepower that costs roughly $3,000 at the online sites — in the four months before the shooting, according to the police. It was pretty much as easy as ordering a book from Amazon. He also bought bulletproof vests and other tactical gear, and a high-capacity “drum magazine” large enough to hold 100 rounds and capable of firing 50 or 60 rounds per minute — a purchase that would have been restricted under proposed legislation that has been stalled in Washington for more than a year. Clearly, the (actual) NY Times story refers to ammunition --- not weapons. 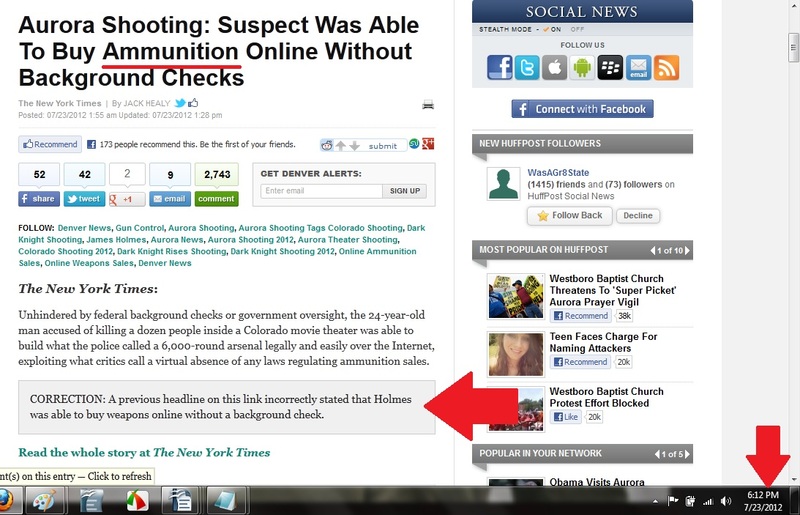 Under current laws --- as HuffPost knew, or should have known --- no one can buy weapons online without a background check. 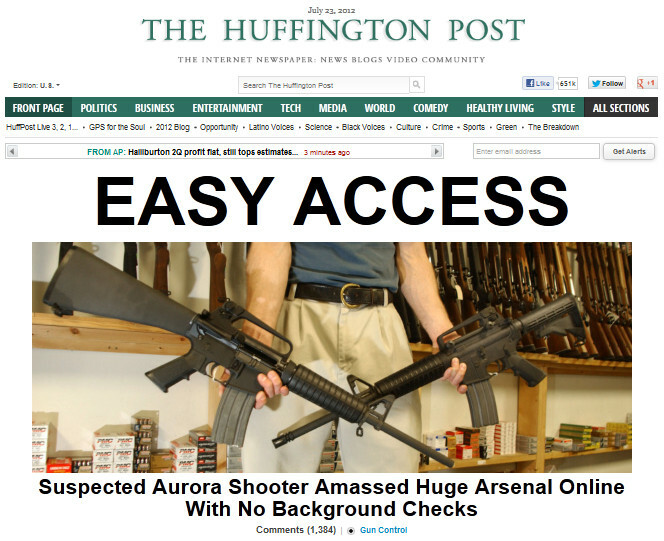 Bottom line: HuffPost lied to its global audience of readers --- the largest on the Internet --- by falsely claiming that one can "buy weapons online without background check." Let's take another look at the story page headline that HuffPost wrote --- even though it knew the New York Times was talking only about ammunition? So why would HuffPost deliberately lie to its global audience? Ask its top people! You might also consider contacting HuffPost's advertisers --- the entities that make possible its pathological lies (below). Sometime late in the afternoon of July 23, HuffPost changed its headline, and admitted it had done so. 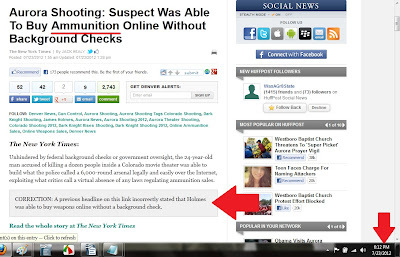 Thanks to all those who wrote in to HuffPost, its advertisers, and the New York Times!!! 2) The HW expose' was also picked up by Robert Moon at Examiner.com, who indicated that as of 4:30pm, HuffPost still had not corrected the headline containing the lie. 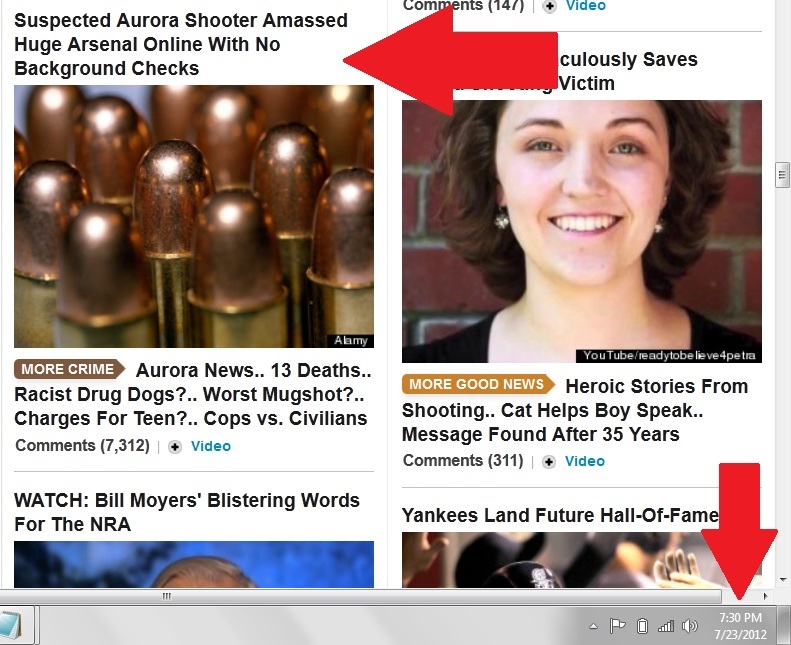 So, for more than 16 hours, HuffPost had the ability to stand atop the corpses in Aurora, CO and foist another lie --- its second in two days, as we documented here. And as it claims it receives more than a million unique visitors per day, its act of deliberate dishonesty may have misinformed two-thirds of a million people. This is one more indication of the fact that this was not all an innocent "mistake," as HuffPost likes to claim when HUFF-WATCH proves its lies, and its deliberate propagation of falsehoods and incitement of hate. Bottom line: Even though it (partially) surrendered at the end, for an entire news cycle on the first Monday after a national tragedy, HuffPost was able to misinform to advance its subversive agenda. And so far, not a single mainstream "journalist" has confronted Arianna about her consistent pattern of turning truth and reality on their heads in order to craft false, incitement-based "news" articles. There is much work to do. But success will be built on small victories --- and today was victory. Thanks for your help!! !